Congratulations to the students and staff from Mullumbimby High School who have just returned from a 10 day excursion to Indonesia, including a visit to Camp Leakey in Kalimantan and to Yogyakarta in Central Java. This marks the first government school excursion to Indonesia in over a decade and teachers Elke Buhruch and Linda Keyte report that the trip was a great success. Please see below for more details about the visit, some wonderful photos as well as information on how to apply for overseas excursions. Advance notice of the excursion is required at least nine months prior to the planned date of departure. observation of rehabilitating orangutans at feeding stations in the jungle. In Jogjakarta students visited the ancient Buddhist temple Borobodur in central Java and tried all forms of local transport including becaks (pedicabs) and dokars (horse drawn carts). language, culture and way of life.” Elke Buhrich, who worked for the Orangutan Foundation International in Kalimantan for 4 years, has extensive experience of orangutans and was able to share her knowledge and her local friendships and contacts providing students with a very unique insight. Mullum High students started fundraising for The Orangutan Project (TOP) early last year. Money raised was used to adopt an orangutan called Bunga and safeguard orangutan habitat. Further fundraising included a mufti day where the whole school wore orange clothing. The excursion to Central Kalimantan provided students the opportunity to see first hand how their hard earned dollars will be spent on orangutan conservation. Reforestation Project, and the Yayorin (Yayasan Orangutan Indonesia) Conservation Village, where local people are provided training in low-impact, sustainable income-generating activities. Students also planted orangutan friendly trees at the isolated Pesalt Reforestation project. Indonesian teachers Elke Buhrich and Linda Keyte hope the trip will become an annual event to encourage students to study Indonesian at high school. The students hope so too! Great news for students of Indonesian in Year 12 - the Australia Indonesia Association of NSW is offering one Year 12 student a $500 cash scholarship for study material, participation in Indonesian related activities or as a contribution to an in-country experience. See the flyer below for more details or click here. THERE ARE STILL SOME PLACES LEFT FOR WORKSHOPS IN THE NEXT FEW WEEKS. PLEASE CONTACT JUDY SHELLEY ASAP IF YOU ARE INTERESTED IN BOOKING A WORKSHOP AT YOUR SCHOOL. The Australia Indonesia Arts Alliance (AIAA) is presenting a series of workshops in Gamelan, Angklung, Kecak and Balinese offerings free to government schools in NSW, through their Artist in Residence Program. All government schools with an Indonesian program are invited to participate in the workshops, which will also have a language focus. Please check your calendar and book in ASAP. Priority will be given to bookings received before or during the holidays. Workshops commencing in May will be for schools in Sydney to the South Coast and in June for schools in regions north of Sydney. For more information and for bookings, contact Judy Shelly ASAP. Balinese musician Made Denis comes from the traditional village of Tianyar in East Bali. He is a gamelan artist of extraordinary talent with over 20 years experience in Balinese music forms specialising in the deeply expressive and soulful Balinese suling (bamboo flute) and the exciting, dynamic kendang tunggal (Balinese drum). Made Denis will tour Australia in 2014 as Visiting Musician with the Australia Indonesia Arts Alliance, working to inspire and enliven Balinese music and culture across Australia. Made Denis presents an eclectic and far-reaching array of traditional to contemporary music from Balinese gamelan and kecak to contemporary world music and modern Balinese pop culture. Many of you will remember our lovely Indonesian Teaching Assistant, Asti, who worked with Jo Peard at Woollooware High School in 2012 and from the ELTF program at the IALF in Bali. Asti has been putting together a wonderful new website for Indonesian teachers called Learn Indo. There are lots of resources for teachers sorted into sections such as Grammar, Culture, Songs, Languages Skills and so on. It is a work in progress and Asti is keen for teachers to contact her with feedback and suggestions for other resources you would like included on the site. Terima kasih banyak Asti! 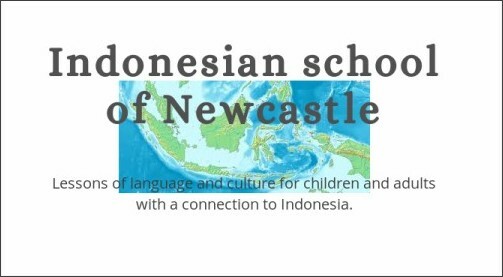 Scotts Head Public School on the mid North Coast of NSW is seeking an Indonesian teacher for the school's bilingual program. Approval to teach Indonesian and native speaker proficiency in Indonesian. teaching programs across key learning areas within a K-6 setting. Well-developed communication and interpersonal skills with the capacity to build relationships and engage students, staff, parents and community. Scotts Head Public School is a small school situated in the coastal village of Scotts Head on the Mid North Coast of New South Wales. The school structure consists of three multi-stage classes and a straight Kindergarten. The school has an enrolment of 100 students, 15 of whom are Aboriginal. The Bilingual teacher teaches classes across a number of key learning areas in Bahasa Indonesia. This is the fourth year the program has been running. This program delivers the regular curriculum for 45 minutes a day in Indonesian and creates links with our Asian Neighbours. This is the first step in expanding the minds of our students who will be able to engage in future global environments, be global citizens that can also act locally. This is a temporary, part time position for 3 days per week 0.6 FTE , Monday, Tuesday, Wednesday, (maternity leave position) for Term 3 and 4, 2014 with the possibility of extension. Closing date for applications is 18 July, 2014.